In his recent Huffington Post article entitled, The Past and the Future of the Citizen Artist, Nick Rabkin justly credits settlement houses as the original home of the citizen artist. However, his assertion that the settlements are “all but gone” must be reconsidered. Not only are settlements still alive and well across the globe, but they also remain extraordinarily committed to supporting healthy and engaged communities, often most effectively through community arts and citizen artists. At University Settlement in New York City, for example, we have created an all-too-rare experimental ground in which the work often divided among arts presenters, arts educators, artist support organizations and social service programs is being melded into one cohesive and interconnected whole. Many of today’s settlement houses are still hiring young workers, without degrees, from the communities they serve, providing first jobs and crucial training to youth with increasingly limited options. However, there is severely limited funding to invest in truly developing and empowering the talents of these part-time, seasonal, after-school youth workers, who are paid an hourly rate slightly above minimum wage for typically 20 hours a week without benefits. In our current climate, where college dropout rates are soaring and young adult unemployment rates are above 50% in many U.S. cities, it is particularly profound to note that Spolin attributed her inspiration, effectiveness and success as an artist and educator to her training at the Hull House. The settlement house model has thrived worldwide for nearly a century and half because these organizations were intentionally designed to be incubators for fellowship, human potential and responsiveness to the ever-evolving needs of low-income communities over time. From its inception the Settlement House Movement viewed the arts as a means for strengthening community life, re-spiriting the aspirations of individuals of all ages, and building mutually beneficial relationships between people from diverse backgrounds and classes. Nevertheless, beginning in the 50’s, settlement houses in the United States had to adapt, due in large part to the success of their own advocacy efforts, as the government began providing more safety nets for economically struggling families. A philanthropic shift away from private unrestricted funds to more targeted public sponsorship took hold. And along with this came increasing calls for the professionalization and expansion of the social sector. Less time and investment could be dedicated to developing the talents of young community workers, like Spolin, who did not have degrees and credentials from higher learning institutions. In 2007 I was hired to work with this uneven playing field and bring a comprehensive arts program back to University Settlement, the first settlement house in the United States. Arts programming had gotten lost at this institution amidst the great demand to provide perpetually undercapitalized yet essential social services. A desire to be true to the original ideals of the Settlement House Movement combined with the gentrification of the Lower East Side community served by University Settlement for over 125 years created a real need for the arts to build bridges of understanding and connection between new affluent neighbors and the long-time low-income residents. My approach to developing an organizational vision for University Settlement’s Arts program was certainly influenced by many years of being a New York City teaching artist and by my experiences running an after-school and family literacy program. But my professional experience and formal training as a theater artist and educator did not inform or inspire this process as much as having grown up through the ‘80s and ‘90s at another nearby Lower East Side settlement, Henry Street. From the intense dedication of my mother, Susan Fleminger, a pioneer of the teaching artist movement and the deputy director of Henry Street Settlement’s Abrons Arts Center, and the deeply compassionate visionary leadership of my step-father, Daniel Kronenfeld, one the most effective executive directors in settlement house history, I learned that being a settlement house worker is not just a job, it is a way of life that requires a willingness to immerse oneself in the complexities of truly diverse communities. In today’s lexicon the word “settlement” is a bit confounding. Most people I encounter think settlement houses were created to help new immigrants “settle” into their new countries and perhaps, as critics of the movement have suggested, many settlements did become an instrument for assimilating immigrants. However, the progressive thought leadership that inspired this movement called for university educated elites to be the ones to “settle” themselves in communities that had limited access to the cultural capital needed to better one’s life circumstances. The driving belief was that in order to truly understand and serve the particular needs and desires of a disadvantaged community one needs to be living within it. Jane Addams, the mother of the American settlement house movement and founder of Hull House, felt that most of the problems in society stem from the fact that people of different classes don’t spend time together exchanging their life experiences. She observed that, despite the preconceived notions we might have about each other’s strengths and weaknesses, authentic opportunities for connection would inevitably lead to a common understanding and demand for a socially just society. Of course, in an increasingly stratified city like New York, building relationships between people from different walks of life can be an uphill battle, where both conscious and unconscious resistance is encountered from all sides. Growing up as a person of privilege within the settlement house world, I have repeatedly witnessed and experienced first-hand that good intentions and progressive values aren’t enough to bring about true social transformation. A space must exist where everyone is empowered as co-creators and producers in designing projects for community building. In addition, everyone requires the supportive structure needed to become honestly aware of – and then transcend – their deeply held limiting beliefs about what is possible for themselves and others. As Spolin recommended in her book, Improvisation for the Theater, we must “work with people where they are not where we think they should be” because “each person’s immediate capacity for participation must be respected” for a true sense of ensemble to emerge. Therefore our vision for University Settlement’s Arts program aims to support artists at every stage of development. The Performance Project, our public presenting series in our beautifully restored historic theater, offers professional artists – and those who have not had the privilege required to self-identify as artists – a unique residency opportunity. The professional artists invited to “settle” within our community are selected by a panel of staff working directly with our community members in a variety of different social programs. We choose artists because of the quality of their work and the open, welcoming nature of their process. We are intentional about attracting artists who believe that creativity is a skill set that can be shared and learned. We seek artists who have demonstrated a commitment to restoring the notion that everybody has an artistic birthright to reclaim and, in doing so, their quality of life is improved. We then work with our artists-in-residence over the course of a year, and sometimes several years, to deeply nurture both their creative work as well as their ability to develop reciprocal mentoring relationships with both Settlement staff and program participants. Artists are provided with free rehearsal space and production support and, in the grand tradition of the Settlement House Movement, they are asked to collaborate with staff and participants to organically develop ways of sharing their creative ideas, skills and resources with our community. But, what makes our arts program truly unique is the level of investment we have put into scaffolding the collaboration between artists and our young program staff, the vast majority of whom come from the low-income communities served by the Settlement and who typically have had limited access to the arts. Instead of the classic teaching artist model where the artist, as visitor, is unrealistically required to either change or adapt to a culture that is often not conducive to art making, we have offered our young staff opportunities to co-curate and co-facilitate a permanent shift in our organizational culture so that everyone’s ability to learn and grow through creative exploration is activated. Play Tank is University Settlement’s innovative talent development institute designed to support the professional and artistic growth of young adults deeply committed to working for community based organizations. 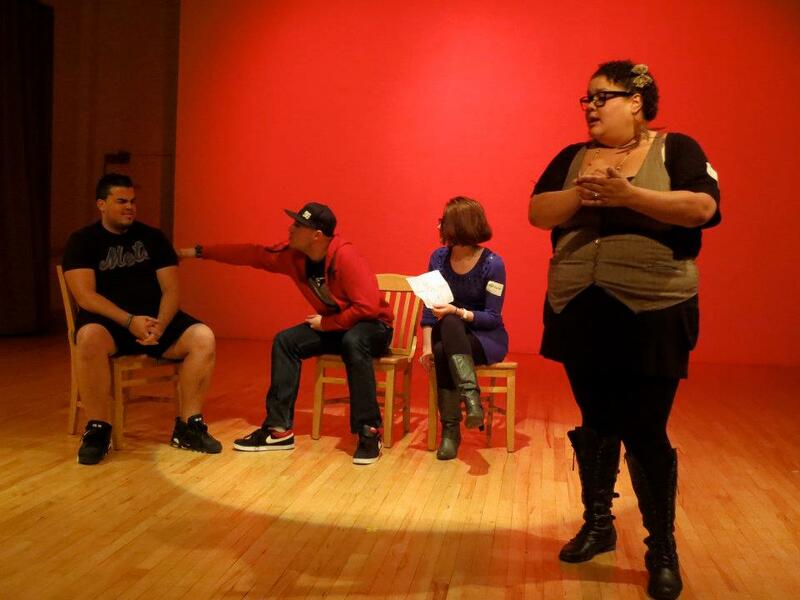 Play Tank operates as a professional performance ensemble and production team, as we believe our next generation of community leaders must be compelling skillful visionaries adept at problem-solving, cooperation and network building. After creating and performing two original professional productions over a two-year period our Play Tankers have become the linchpins of our approach. They are now recognized and highly respected young artists in our community with a true sense of their own creative capacities and an authentic openness to mentorship from more established artists and educators. Together teams of Play Tankers and professional artists have been establishing and co-directing other ongoing community ensembles serving middle school youth, high school youth, special needs young adults and senior citizens at our various program locations. Our community artists curate and produce special events, skill-building arts workshops and a monthly salon series where artists at different stages of development share their work in with one another. In addition, our annual Community Ensemble Festival provides each ensemble the opportunity to feel that they are an essential part of an interconnected hub for creativity, empowerment and resiliency. In his article Rabkin calls for the reconciliation of our core values, assumptions and organizational cultures so we can support the future of the citizen artist. As the director of the Play Tank’s first two collaboratively devised plays, and from interacting with countless creative colleagues, I have a real sense of what this process actually requires of us. As Spolin discovered at the Hull House, “If the environment permits it, anyone can learn whatever he or she chooses to learn, and if the individual permits it, the environment will teach everything it has to teach.” I believe the next generation of citizen artists will emerge from the communities where people are both willing and permitted to create the vulnerable moments of disequilibrium that frighten us, because this how we become more human human beings. This is how we make transformative art and learn to value our connections to each other above all else. Alison Fleminger is the founding Program Curator of The Performance Project @ University Settlement and the Artistic Director of The Play Tank Theater Ensemble. She has nearly twenty years of experience designing and implementing arts programming for organizations and artists of all ages. She has worked at The Kitchen, Abrons Arts Center, Manhattan Youth, and Project Reach Youth. She has directed more than 15 original productions with non-professional performers. Her work as a teaching artist for Arts Connection’s federal research project DELLTA (Developing English Language Literacy through the Arts) was featured on ABC News. While earning her Graduate Degree in Theater Education from NYU, she apprenticed at the CAT Youth Theater. Most recently she earned a Certificate of Organizational Design from The Empowerment Institute for Social Change.